“Forgetting the past and looking forward to what lies ahead.” Philippians 3:13 NLT. Forgetting is often where healing begins. A good memory is a good thing, if it is the good that you remember. Sometimes forgetfulness can be good. I seem to be doing that more frequently. Here’s the problem. Strangely enough, people seem to remember what they should forget and forget things they should remember. There are too many things that only bring worry or pain, stuff for which you have no answer or explanation. Those accumulate like so much trash, crowding out more profitable matters that encourage and edify. Growing up, my chore was to take out the trash, and my Dad kept me reminded to do so. I needed his frequent reminding; “Son, have you taken out the trash?” The process began with gathering up all the stuff needing to be carried out, thrown away, and hauled away. Whether or not that was his intent, my Dad taught me a valuable lesson about everyday life. Life works better when you regularly remove the accumulated trash. The Old Testament story of Joseph is a good example. His history held a lot of hurt, both interpersonal and intrapersonal. Some resulted from his lack of wisdom, but most of his pain was imposed upon him by others. To survive and keep his dreams, Joseph had to learn how to take out the trash from his unfair, painful past. Joseph forgave and forgot. Forgiveness without forgetting is not as freeing as God intends. In Egypt, two sons were born to Joseph. Read Genesis 41:51-52 NIV. His first son, he named Manasseh, meaning, “For God made me forget all my trouble.” Forgetting is where healing begins. His second son, he named Ephraim, meaning, “For God has made me fruitful in my suffering.” Remembering can be where celebrating begins. Go ahead. Forget some things; that can be a good thing. Remember the good things; that is an even better thing. Each New Year’s Eve the world celebrates in their wish for things to be better in the New Year, somehow different than they were. But wishing will not make that so. Things once done cannot easily be undone, except by God. Your past can be a confining place where things hold you that you alone cannot change. Churches will also gather in homes or sanctuaries this New Year’s Eve, grateful to God that He takes away old sins and mistakes, and offers forgiveness and fresh beginnings in Christ. “If anyone is in Christ Jesus, he is a new creation; old things are passed away, and all things have become new.” 2 Corinthians 5.17. More than a New Year, you may need a new you. “Praise be to the God and Father of our Lord Jesus Christ! In His great mercy He has given us new birth into a living hope through the resurrection of Jesus Christ from the dead, and into an inheritance that can never perish, spoil or fade-kept in heaven for you.” 1 Peter 1:3-4 NIV. Regrets? Everyone has a few. Mistakes, mishaps, or misunderstandings may have colored your appraisal of the past, but in grace, God has given you the power of choice to greatly reshape a new year. “I am still not all I should be, but I am focusing all my energies on this one thing: forgetting the past and looking forward to what lies ahead, I strain to reach the end of the race and receive the prize for which God, through Christ Jesus, is calling us up to heaven.” Philippians 3:13-14 NLT. Today, my prayer for you is: let your estimation of the past be graced and anticipation unaffected. Christmas is for the child in all of us – the eternal, ageless spirit within that never grows old nor grows bored. “When the shepherds had seen Him, they made widely known the saying which was told them concerning this Child. And all those who heard it marveled at those things which were told them by the shepherds. But Mary kept all these things and pondered them in her heart. Then the shepherds returned, glorifying and praising God for all the things that they had heard and seen, as it was told them.” Luke 2:17-20 NKJV. Christmas is for the child-like heart in every one of us who hears or reads the story of the Nativity with wide-eyed and open-mouthed wonder that God Himself – Almighty and Eternal – would come into our world in a way unimagined, to a place unspectacular, and at a time unexpected in the likeness of His frail creation, in the form of a dependent, helpless child. Christmas is not for the pseudo-sophisticated who think they have all the answers. Christmas is for child-like hearts who embrace the wonder of His coming as a child who would become Savior and Redeemer of all. Jesus Himself said, “Except you change and become as little children, you will never enter the Kingdom of Heaven.” Matthew 18:3-4 NIV. There is much of spiritual reality that is reserved for child-like hearts. 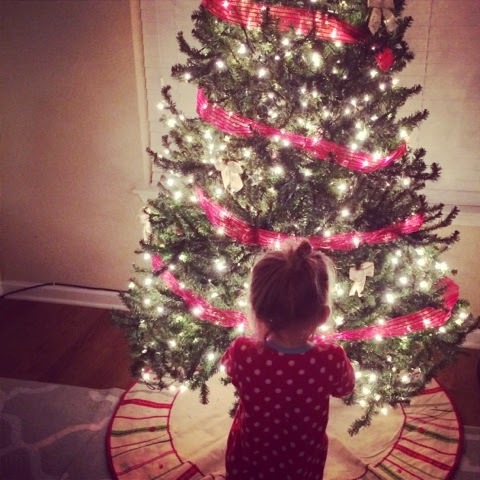 I love this picture of Kaylee, our almost three year old great grandchild with whom we will spend Christmas Day. I want to never lose the wonder I see in her eyes as she explores and learns. Gayle and I are so grateful for your partnership and support of EveryDay Life across this year, all too quickly passed. May you never lose the wonder of endless discovery of this One who came to be your Savior. “Thank God for His Son – a gift too wonderful for words.” 2 Corinthians 9:15 NLT. Giving that is meaningful is inseparably sourced in love that is authentic. Christmas gift giving is an art form with some people. Christmas is easier for people like my wife, Gayle; as Christmas approaches, she has already planned for family and friends and thought of the gifts most wanted and needed by them. Such people anticipate what best serves or delights the recipient. I admire people with such a talent. I don’t struggle with the act of giving; I find joy in that. Read 2 Corinthians 9:7-8 NIV. I struggle to know what to give, unsure if my choice of gifts will be enjoyed, or appropriate, or best meet their need, or serve them well. My dilemma is finding a gift that expresses my love and appreciation adequately and accurately. Christmas is such a special time of year. I love everything about celebrating Christmas – the wondrous Christmas story, times together with family and friends, the tree and decorations, the Nativity scenes, flickering candles and logs in the fireplace, Holly and wreaths, eggnog and sweets, Christmas choirs and carols, mistletoe, and, of course, beautifully wrapped presents under the tree. But none of those would mean anything apart from God’s greatest gift to you and me. Among all of God’s generous and gracious gifts, God’s greatest gift was given at Christmas. Paul found the generosity and grace of God’s gift to be inexpressible, “Thank God for His Son – a gift too wonderful for words.” 2 Corinthians 9:15 NLT. Christmas’ greatest Gift could not be described more beautifully or accurately. For some who decry the commercialization of Christmas, Christmas is only commercialized by those who overlook Christmas truth. Read James 1:17-18 NIV. Christmas need not be separated from gift giving. The Wise men, “rejoiced with great joy . . and fell down and worshiped Him, opening their treasures they presented gifts to Him of gold, frankincense, and myrrh.” Matthew 2:10-11. Their gifts were costly but not extravagant, unusual but not inappropriate. Their love and joy would not let them do less. Those gifts expressed their hearts’ response to the far greater Gift – the promised and long awaited Messiah, who was the Son of God and would become the Savior of men. Read Ephesians 1:3-14 NIV. Gift giving is appropriate to your celebration of Christmas. As a boy, I heard my Dad often say, “You can give without loving, but you cannot love without giving.” Across the years, I find that true. Christmas is the testimony to that truth. Giving that is meaningful is inseparably sourced in love that is authentic. Love always prompts a generous response. The Good News that angels proclaimed to shepherds describes the perfect gift of which John later wrote, “For God so loved the world that He gave His one and only Son, that whoever believes in Him shall not perish but have eternal life.” Read John 3:16-21 NIV. The better you know the person to whom a gift is given, the more your gift will meet their need and bring them joy. God’s Christmas Gift responds exactly to His accurate estimate and adequate supply of your greatest needs. “The gift of God is eternal life in Jesus Christ our Lord.” Romans 6:23 NIV. And His gift empowers, as well as obligates, each recipient of eternal life that, “we should use whatever gift [we] have received to serve others, faithfully administering God’s grace in its various forms.” 1 Peter 4:10-11 NIV. My prayer for you this Advent is that you receive graciously from God and give generously to others. “The things which are impossible with men are possible with God.” Luke 18:28 NKJV. Christmas is when the Almighty God changed impossibilities to possibilities. The things which are impossible with men are possible with God. Luke 18:28. No few words describe Christmas any clearer than that. Christmas is the perpetual reminder that the Almighty God changes impossibilities into possibilities. Unlike all others, our God delights in doing what others say cannot be done. Christ is the mighty power of God and the wonderful wisdom of God. This ‘foolish’ plan of God is far wiser than the wisest of human plans, and God’s weakness is far stronger than the greatest of human strength. 1 Corinthians 1:24-25 NLT. Centuries before Jesus was born, prophets foretold of Israel’s Messiah who would come; Israel waited. Behold, a virgin will conceive and bear a Son, and shall call His name ‘Immanuel, God is with us.’ Isaiah 7:14. God chose what men knew to be impossible to explain what was unimaginable. A child born to a virgin? Impossible. A Savior who came for sinners? Incomparable. God coming into your world? Indescribable. To her heavenly messenger, Mary asked, “How will this be since I am a virgin?” Luke 1:34 NIV. The Angel’s answer was profoundly simple, “Nothing is impossible for God.” Luke 1:37 NIV. Mary knew why it could not happen; God knew why it would. With assurance from the Angel, Mary trusted every impossibility into God’s hands. Christmas would forever mean that nothing would ever be the same again for Mary. More than a sacred story or seasonal celebration, Christmas is any moment when eternity penetrates time with the promise of possibilities. Christmas changes anything that ever has been and everything that still could be. For you as well this Christmas, the Angel’s words remain true, “Nothing is impossible with God.” That Christmas truth changed every assumption Mary had believed. Let that be true for you this Christmas. The situations that appear impossible to you – the need that exceeds your ability or resource – the obstacle that defies your efforts – the sin that seems indomitable – the failure that would steal your future – all these are well within the incomparable power of God to redeem. Christmas is when you surrender to the Almighty God your impossibilities, “Who is able to do immeasurably more than all we ask or imagine.” Ephesians 3:20 NIV. Christmas possibilities are without limits. My prayer for you this Advent is to welcome Jesus into your life as Savior and Lord. “Mary treasured up all these things and pondered them in her heart.” Luke 2:19 NIV. 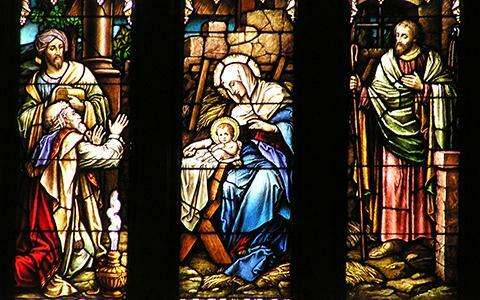 Christmas holds both the mystery of the Child and the majesty of the Christ. Life presents moments that pique your curiosity until you just must know more. Some of those are coincidental; a few, but more than you might realize, are providential. I regret any time I was too busy to notice moments of divine providence. I am grateful for every time I allowed God to interrupt my plans with His opportunities. Such instances can change your course and shape your life in unexpected ways. Christmas should be one of those times. On the first Christmas, the eternal and almighty God personally came into our world at an unexpected time (after 400 years of Heaven’s silence), to an unlikely place (to a stable, not a palace), and in an unimaginable manner (in a natural process possible only by supernatural means). The Creator became as His creation; the Eternal became subject to mortality; the Omnipotent became conventional. Christmas holds both the mystery of the Child and the majesty of the Christ, presenting questions only God and faith can adequately answer. The Apostle Paul described the Incarnation to Timothy, his young protégé, “Without question, this is the great mystery of our faith: Christ appeared in the flesh and was shown to be righteous.” 1 Timothy 3:16 NLT. Peter simply wrote, “[We] were eyewitnesses of His majesty.” 2 Peter 1:16 NIV. I love the Christmas story as told by Luke. Read Luke 2:1-20. Angels fill the Judean night with praise and pronouncements to humble shepherds routinely busy about their drab and daily life. Leaving their flocks, the shepherds hurried to find this One of whom the Angels sang. Of course, the shepherds told Mary and Joseph their story, as they later, “spread the word that had been told them about this child. And all who heard it wondered at the things which were told them by the shepherds.” People’s “wonder” is variously translated as, “amazed, marveled, or astonished.” Christmas should arouse wonder and amazement. Mary’s response provides my thoughts and comments today; “Mary treasured up all these things and pondered them in her heart.” Luke 2:19 NIV. What a model of spiritual life for you and me. Mary “treasured and pondered in her heart” the words and workings of God. Spiritual discovery originates in the heart, then engages the mind for understanding and the will for appropriate action. Generations earlier, Solomon gave strong counsel, “Ponder the path of your feet, and let all your ways be established.” Read Proverbs 4:21-27 NKJV. Mary’s attitude was reverential; Mary “treasured” the Angel’s words that began her journey of obedience and trust, as she embraced the awe-filled story of the shepherds’ angelic visit and pronouncement, just as she would esteem the Wise Men’s journey from afar. She placed high value on all that God said and did and cherished it all in her heart. Mary’s posture was wonder and worship. Mary “pondered” the Angel’s words. “Ponder” is the process of, “putting one thing with another in considering circumstances.” Mary was deliberate, reflective, and ultimately receptive. Mary’s reasoned response was, “My soul magnifies the Lord, and my spirit has rejoiced in God my Savior for He has regarded the lowly estate of His maidservant . . for He who is mighty has done great things and holy is His name.” Read Mary’s joyous Magnificat, Luke 1:46-55. This Advent, my prayer is that Christmas is released in your heart with fresh wonder and discovery.